Last weekend saw four teams claim WPIAL Championships at Heinz Field. OLSH won their first Championship in school history by claiming the 1A title. Aliquippa added to their record number of Championships by defeating Derry for the 3A crown. South Fayette topped Thomas Jefferson in epic fashion, coming up with an interception in the end zone with under a minute to play to seal the win. Thomas Jefferson came up short in their attempt to become the third WPIAL team to win four consecutive championships. In 6A, Pine-Richland won their second straight title by hammering Seneca Valley. This weekend the last two classifications have their Championship Games. The 5A title game will take place on Friday night while the 2A Championship will be on Saturday afternoon. 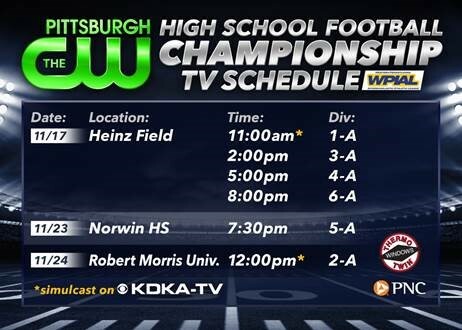 This year, all six WPIAL Championship Games will be broadcast on The CW and KDKA. The best part of the WPIAL games moving to The CW this year is that all of them will be shown live. 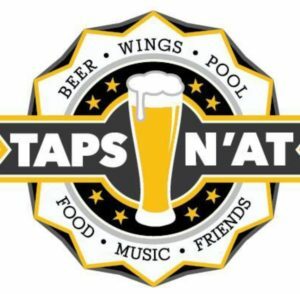 Thanks to our WPIAL content sponsors Taps n’at from Derry who had a great run this year following Derry to their first title game appearance since 1945. If you’re going to be following along with the WPIAL action throughout the day, keep an eye on the #WPIAL hashtag on Twitter where people post score updates from games. Below I’ve listed team-specific accounts to also keep an eye on throughout the day. 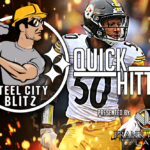 I’ll also be posting score updates and commentary from my Twitter account @thesteelersnat. Penn Hills moved down from 6A to 5A this season and has dominated. The Indians were one of two 5A teams (Gateway being the other) to finish the regular season undefeated. They scored at least 34 points in all but one regular season game and pitched 3 shutouts. Prior to their semifinal victory over Peters Twp, Baldwin was the only WPIAL team to come within 20 points of Penn Hills. After breezing past Latrobe and McKeesport, Penn Hills fell behind 14-0 in the first half of their semifinal. The defense locked it down from there and the Indians battled back to tie the game in the 4th quarter. After an interception, Penn Hills cashed in to take a 22-14 lead which they held to reach their first WPIAL Championship Game in over a decade. West Allegheny’s storyline this season has been centered around head coach Bob Palko, who has won more WPIAL Championships (8) than any other coach. Prior to this season, Palko announced that this would be his last year at the helm for West Allegheny. He consistently displayed his ability as a big-game coach this season, scoring a Week 2 victory over Bethel Park in overtime with a successful two-point conversion. After a loss to Peters Twp, West A squeaked out a 1-point win over Woodland Hills and a 3-point win over Baldwin. They got revenge on their rivals Moon who had topped them last year, in Week 9. In the playoffs, the Indians blew past Shaler then beat Woodland Hills by the same 14-13 margin they did earlier in the season. In the semifinal, Bob Palko proved he would not go quietly off into the sunset and pulled off a 42-28 upset over top-seeded defending WPIAL Champions Gateway. This is the first ever meeting between Penn Hills and West Allegheny in the WPIAL playoffs. 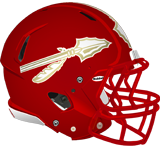 Penn Hills reached the semifinals in 6A last season, which was the first time the Indians had won a playoff game since 2009. The last WPIAL Championship Game appearance for Penn Hills was in 2006 when they lost the AAAA title game to Upper St Clair. Under Bob Palko, West Allegheny has been one of the best postseason teams in the WPIAL. This is their second title game appearance in the last 3 years and 5th title game in the last 7 years. West Allegheny won the 2016 WPIAL Championship in epic fashion over McKeesport in a game that went to overtime and West A won on a 2-point conversion. Last year, West A fell to McKeesport in the quarterfinals in a revenge game. Penn Hills was the best team of the 1970s. They won the WPIAL AAA Championship in 1976 and 1978 and tied Butler for the 1977 WPIAL AAA Championship when there was no overtime. In 1979, Penn Hills defeated Gateway in the WPIAL Championship Game, which was later vacated by the WPIAL because of an ineligible player. A federal judge overturned the WPIAL’s decision and restored the 1979 title to Penn Hills. After PIAA moved to 4 classifications in 1980, Penn Hills would not make it back to a WPIAL Championship Game until 1995 when they defeated Upper St Clair 20-13 to win the AAAA title. They later defeated Lower Dauphin 35-14 to win the 1995 PIAA AAAA Championship. West Allegheny won the WPIAL Championship in 1997, 1999, 2000, 2001, 2009, 2012, 2013, and 2016. West A also won the 2001 PIAA Championship 28-13 over Strath Haven (who had beaten them in the PIAA title game the prior two seasons). All eight of West A’s championships have been won with Bob Palko as head coach and he is 8-1 in WPIAL title games. Penn Hills is absolutely loaded with talented players, led by Hollis Mathis (the best quarterback in the state) and the best secondary in the WPIAL. Mathis leads 5A in passing with 2365 yards and 34 TDs and has also run for 605 yards and 6 TDs. Leading receivers Daequan Hardy (651 yards, 17 TDs) and Dante Cephas (520 yards, 12 TDs) are both D1 talents at defensive back. Cephas has committed to Kent State while Hardy has offers from some Big Ten schools. Fellow WR/DB Cory Thomas (198 yards, 4 TDs) also has offers from some MAC schools. Anthony Grimes (409 yards, 5 TDs) and Richard Martin (211 yards, 3 TDs) have also been contributors in the passing game. On the ground, Tank Smith has been the workhorse running back, grinding out 1427 yards and 18 TDs and averaging over 8 yards per carry. The backfield duo of Hollis Mathis and Tank Smith have both committed to Howard. The amount of Penn Hills players with D-1 offers will not phase West Allegheny, as the Gateway team they defeated last week was also loaded with D1 talent. 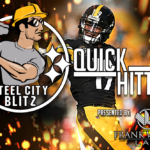 Bob Palko’s crew is led by dual-threat QB Kam Kruze who has thrown for 1211 yards and 14 TDs and run for 340 yards and 7 scores. Kruze is joined in the backfield by the Flati brothers, who both average over 5 yards per carry. Dante Flati leads the way with 909 rushing yards, 211 receiving yards, and has scored 10 TDs. But it was sophomore Nico Flati who was the star last week against Gateway, running for 144 yards and scoring 3 times on the ground and once through the air. On the season, Nico has run for 460 yards and scored 6 times. Tight End Mateo Vandamia (251 yards, 5 TDs) has some FCS offers and is also a quality defensive lineman. On the outside, Drevon Baldwin (345 yards, 6 TDs) and Kyle Guilfoil (255 yards, 2 TDs) are Kruze’s favorite targets. Steel Valley had a tough start to the season with their first 3 games coming against the 3 other teams from their conference that made the playoffs. The Ironmen edged Avonworth 31-24 but lost a shootout to Shady Side Academy 56-36. After that loss, Steel Valley tightened up on defense and pitched 4 shutouts over their next 9 games, including two in the playoffs. In the quarterfinals, the Ironmen got revenge on Washington (who topped them in the WPIAL title game last year) then blew out Freedom 40-0 in the semifinals. 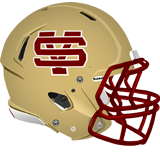 Notably, Steel Valley crushed South Side Beaver in a Week 9 non-conference game 53-6. Both Steel Valley and South Side Beaver finished second in their respective conferences but have successfully navigated the playoffs to reach the title game. South Side Beaver got off to a strong start to the season then lost a game to Burgettstown that saw a mid-game weather delay. The teams started the game on Friday night with Burgettstown getting out to a 20-0 lead but a lightning storm postponed the second half until Saturday morning where South Side Beaver staged a 21-3 comeback only to come up just short on a two-point try at the end to lose 23-20. In the playoffs, they edged McGuffey in a first-round shootout then beat top-seeded Shady Side Academy who was without their star QB. In the semifinals, the Rams defense was able to contain Charleroi and their running game did enough to carve out a 26-21 victory in a game that was back-and-forth all night. Steel Valley has been one of the most successful teams of the six-classification era. Their Week 3 loss to Shady Side Academy is their only regular-season defeat in the last three seasons. 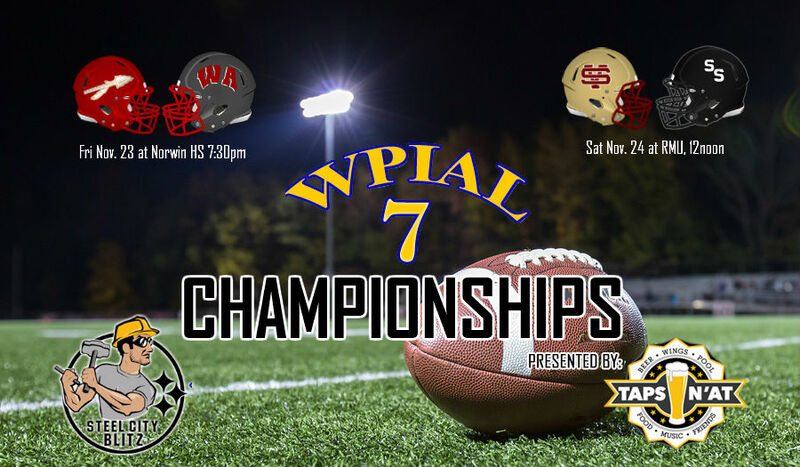 Steel Valley is making their third straight WPIAL Championship Game appearance, having won both the WPIAL and PIAA titles in 2016. Last season they fell to Washington in the WPIAL Championship. South Side Beaver’s first round victory over McGuffey was their first playoff win since 2014. The Rams continued on to make their first semifinal appearance since 2004 and will be making their first Championship Game appearance since 1999. Steel Valley has won four WPIAL Championships. The Ironmen won the 1982 WPIAL AAA Championship, 1988 and 1989 WPIAL AA Championships, and 2016 WPIAL 2A Championship. They aslo won the 2016 PIAA Championship, defeating Southern Columbia 49-7. South Side Beaver has won two WPIAL Championships. The Rams won the 1970 and 1999 WPIAL Class A Championships. They also won the 1999 PIAA Class A Championship, defeating Southern Columbia 27-21. These are two run-heavy teams and three of the top four rushers in 2A will be appearing in this game. Steel Valley boasts a two-headed monster in the backfield as both backs have run for over 1000 yards. Kam Williams leads the way with 1809 rushing yards and 404 receiving yards and has scored 22 times. Todd Hill has also been a dynamic playmaker, running for 1618 yards, adding 154 through the air, and scoring 30 times. Hill is one of the best linebackers in the WPIAL will be joining the aforementioned Hollis Mathis and Tank Smith of Penn Hills at Howard. The Ironmen have been so good on the ground that they have been able to keep the pressure off of QB Ronnell Lawrence, but he has had a good season, throwing for 1054 yards and 12 TDs. Lawrence’s favorite targets have been Eshawn Carter (491 yards, 8 TDs), Williams, Hill, and Sean Meadows (129 yards, 3 TDs). South Side Beaver is also a run-heavy Wing-T offense that has four players averaging over six yards per carry. Jake Botkin is the workhorse back with 1587 yards and 22 TDs. Botkin ran for 140 yards and 2 TDs last week, including the game-winner, to lead the Rams past Charleroi. Derek Franchek (633 yards, 11 TDs), Jordan Bruce (526 yards, 4 TDs), and Anthony Navarra (483 yards, 2 TDs) have also contributed to the success of the Rams ground and pound attack. South Side’s running game has been so good that they have not needed to throw very often. Trenton Seik has averaged just 7 pass attempts per game, but has thrown for 603 yards and 5 TDs. When the Rams do take to the air, Jake Mcdougal (544 yards, 3 TDs) and Brandon Barber (238 yards, 7 TDs) have been the top receivers.